Quite efficiently, the opening three episodes of the revival demonstrate how the concept works. Rose is a story set in the present, anchored in the mundane with the fantastic creeping in at the edges. The End of the World is a space-age futuristic adventure. The Unquiet Dead is a story set in the past – a horror story where the monsters are inevitably aliens. Of course, that format will be shaken up a bit (The Impossible Planet, for example, is a horror set on a distant planet in the future), but Davies makes a conscious effort to set a blueprint for the show in these opening three episodes. In fact, this blueprint is so effective that Davies will retain it for three of is four seasons. His first, third and fourth seasons will open with an episode set in the present, followed by two episodes that look at the past and the future. It’s a good pattern, and a nice way to open a season. And it’s very clear that Davies has thought a great deal about how to structure a season of the show. It seems designed to welcome new viewers each year. Three of the four seasons open with a past, a present and a future story, making it all gloriously accessible and serving as a demonstration of what the show can do. It’s also worth noting that Davies has also been careful to acknowledge the show’s past. He hasn’t wallowed in continuity. In fact, he is careful about introducing the weight of past history to new viewers, acknowledging that forty years of occasionally contradictory back story don’t make the show accessible. Similarly, the shake-up of the show’s format is an acknowledgement that times have changed and that modern audiences are different from those watching telly two decades earlier. Well, it’s nice to see Philip Hinchcliffe vindicated. The Unquiet Dead is an attempt to acknowledge the wonderful combination of gothic horror and science-fiction that made Hinchcliffe’s Doctor Who so damn iconic. Indeed, the shout-outs to The Talons of Weng-Chiang couldn’t be any more obvious – right down the the haunting of a Victorian music hall by an other-worldly force. given that Hinchcliffe was hounded off the programme, the fact that the third adventure of the revived series should be a throwback to his version of the show feels like a well-earned tribute. It’s tempting to forget that these sorts of aliens-in-a-historical-setting weren’t as ubiquitous in the classic series as we tend to recall. Jon Pertwee and Peter Davison, for example, only really had one such story each. They just made quite an impression, largely due to the work of Robert Holmes and Philip Hinchcliffe in the early Tom Baker years. And Gatiss is very clearly framing The Unquiet Dead as an affectionate throwback. Indeed, even the Doctor himself seems a fan of the format, particularly of reviving iconic figures. 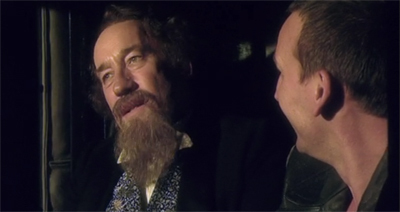 “We’ve brought him back to life,” the Doctor explains, “and he’s more alive now than he’s ever been, old Charlie boy.” These historical adventures are a way of celebrating the past, bringing it back to life for an instant. Not necessarily the real past, as it was, but an idea or a concept of the past. 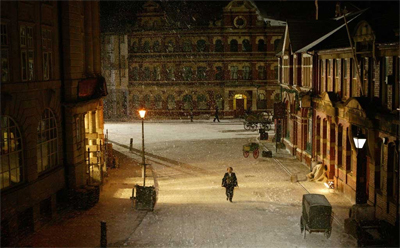 The Doctor might be in Cardiff in1869, but he’s also travelling back to our pop culture idea of Victorian England. There’s a strange joy in that, and the revived Doctor seems to enjoy these nostalgic trips as more of a “fan” than any of his predecessors. He harasses Dickens like some hyperactive fan boy, praising Dickens’ work. Not A Christmas Carol, of course. “No, no, no, the one with the trains. The Signal Man, that’s it. Terrifying! The best short story ever written. You’re a genius.” To a certain extent, there is something just a little patronising about this. Indeed, some of the new series historical adventures feel a little bit too much like an excuse for the Doctor to run through history and shake hands with celebrities, becoming a sort of pop culture heritage tour – with aliens! I’d argue that’s the problem with The Shakespeare Code, for example. Here, though, it’s novel enough to be interesting, and it’s possible to write off the Ninth Doctor’s manic enthusiasm as joy in the fact that he’s not being forced to commit genocide. This is a holiday for a character still dealing with post-traumatic stress disorder. 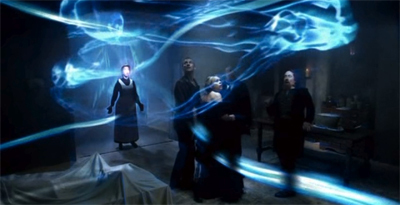 The Unquiet Dead also cements the dynamic between the Doctor and Rose. It acknowledges that there will probably be some measure of romantic tension in a lonely man and a young woman travelling alone together. It also suggests that the affection is more on Rose’s side. “Not a bad life,” the Doctor muses. This prompts Rose to respond, “Better with two.” Not that the Doctor doesn’t send mixed signals. “You look beautiful,” he tells her, even if he quickly adds a “considering…” to remind her that he’s not human. I actually don’t mind the fact that the new series deals with the idea of romance in the TARDIS. 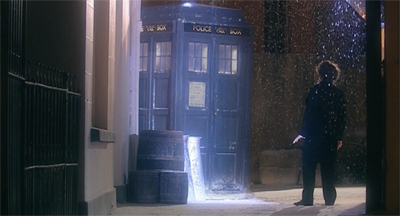 After all, one of the worst things about all the dire TARDIS scenes with Peter Davison and his over-populated TARDIS were rooted in the fact that the show couldn’t even hint at any sexual or romantic tension. (Also the fact that the writers couldn’t write character drama to save their lives, but if you remove sexuality from a crew with a young man, two beautiful women and teenage boy, you are cutting off a lot of options.) It’s only natural that Rose and Martha would read a lot into a handsome and charming man sweeping them away in his magic box. And, despite what people may protest, it’s certainly not new to the show. Though the standards at the time wouldn’t allow it to be confirmed, it seems quite clear that Ian and Barbara are a couple. And one of the best things about the Fourth Doctor and Romana II was the sexual tension that they shared. (Which may have had something to do with Tom Baker and Lalla Ward, but enough of that.) I don’t think it’s unreasonable for the revived series to acknowledge that romantic tension might exist in the TARDIS. I think that the new show doesn’t pull it off perfectly all the time (most notably with Rose and the Tenth Doctor), but there’s nothing inherently wrong with it. It’s just part of something that began properly with the introduction of Ace, the evolution of the companion into a character in their own right, and more than just a plot function. 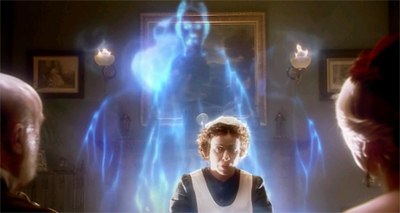 For example, The Unquiet Dead openly acknowledges that the very idea of a companion – a character who exists to get into dangerous situations – doesn’t reflect well on the Doctor as a character. How come he keeps putting people in that sort of danger? At the same time, Rose proves able to do things that the Doctor can’t. She can connect with Gwyneth, somebody who passes mostly under the Doctor’s radar, discussing things as mundane as the “butcher’s boy.” The inference is obvious. 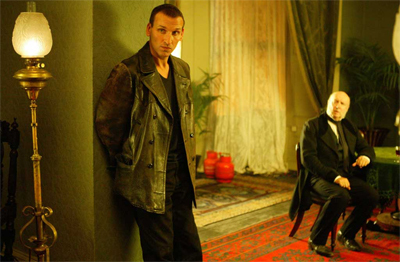 The Doctor broadens Rose’s view of the world, while the companion anchors the Doctor. 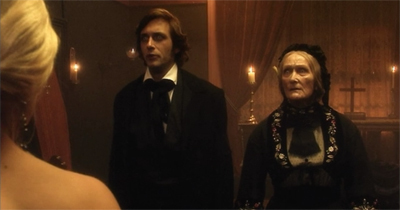 While the Doctor may have a point about the dead bodies, Rose is entirely correct on calling him out about using Gwyneth as a vehicle for the Gelth. “I’ve told you, leave her alone. She’s exhausted and she’s not fighting your battles.” It’s this ability to question one another that is lost when Rose and the Tenth Doctor begin travelling together. There’s a sense that the Ninth Doctor is so defined by the Time War that he really hasn’t come to terms that there is a world outside it. Just like he can’t see the Dalek in Dalek as anything but the last enemy in the conflict, the Gelth represent a chance to salvage something of what was lost – with no thoughts about the repercussions for Earth. The Doctor just allows them to start pouring into Cardiff, with out any safeguard measures or fail safes handy. That said, the fact that the Gelth turn out to be evil is a bit convenient. After all, it’s nice to know the Doctor is willing to radically alter human history by allowing zombies to wander freely around 1869 Cardiff and (presumably) into the present day, but that becomes academic once it’s clear the Gelth are just baddies that need to be destroyed. It is – of course – entirely consistent with the show’s depiction of “monsters”, an essential ingredient of Doctor Who that I am admittedly a little uneasy about, but it is also the earliest indication of a larger problem with the show in general. It’s something of a trademark of the Davies’ era’s view of the show’s connection to reality: there’s a desire to prove that they are willing to shake things up and change the world (yeah, here’s a Cyberman occupation! yeah, Daleks can invade! yeah, the Master can take over!) but then there’s a last minute rush to cram the genie back in the bottle so that the show can remain firmly anchored to the modern world. There’s nothing wrong with Davies’ decision to keep things real – I suspect it’s a massive part of the revival’s success – but his desire to have it both ways feels a bit cheeky. So it’s great to know that this isn’t the relatively conservative Third Doctor who believes history is sacred solely because it is history. Not that any sort of characterisation like that would fit with Davies’ version of the show. 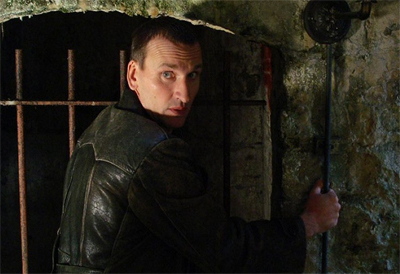 It’s good to know that the Ninth Doctor has no problem with changing history if it saves an entire civilisation. However, the show is never going to let the character follow through on that concept, so it all feels a bit irrelevant. That said, the Gelth turning out to be evil is hardly a radical out-of-nowhere plot twist, so it’s easy enough to forgive this instance what will become a staple of this period of the show – the assertion that reality itself is malleable, but only if we can back-peddle fast enough. Still, this is a minor complaint about what is effectively a reintroduction of the horror historical to Doctor Who. It’s an efficient and a fun way of introducing the audience to a subgenre of story that is fondly remembered, and proof that Davies knows exactly what he is doing with this revived television show.